Writers, painters, singers, filmmakers, musicians, craftspeople, and actors confront daunting challenges every day. It is hard to produce new work, find success in the marketplace, manage relationships, and keep spirits up… Intended for professional artists and those aspiring toward professional status, this book offers the nuts and bolts of sticking to a successful and fulfilling life in the arts. Each topic is explored in depth, in Maisel’s usual easy, conversational writing voice. Next is a coaching story that illustrates the topic and shares how Maisel dialogues a struggling creative person through a personal issue. A short review, as well as a series of questions to help the reader explore on their own, wraps up the chapters. Many creative people and most would-be creative people are interested in their artistic projects but not passionately interested in them. There is a huge difference here, and a big problem. How artists are affected by and react to their society is an enormous topic. Let’s focus on one corner of this vast territory: self-censorship. Most of us assume that we are free to think just about anything and to express ourselves in any way we see fit. In reality, artists do a lot of measuring, somewhere just out of conscious awareness, about what is safe or seemly to reveal and what is not. Let me give you an example from my life. I am an environmentalist so almost anything that negatively impacts nature will make my activist blood simmer. Topics could include fracking, air pollution, and GM crops. Yet I find I hold back commentary about Monsanto, a company I believe to be downright evil and disastrously dangerous to the planet because of its bullying behavior and development of genetically modified (GM) seeds. Why? Because I live in a small town and am surrounded by GM farmers. Even though I think Monsanto is evil, I don’t think my neighbors are. They are just average people working hard to provide for their families. They might be misguided and "in up to their ears", but they are not evil. So I censor my commentary, which brings the state of my writing back to that aforementioned loss of passion. It's very hard to be passionate when you are self-censoring. Can you see the connections? I certainly can. This book will likely help you with some aspect of your creative life as well, especially if you need a bit of coaching and encouragement. I highly recommend it! 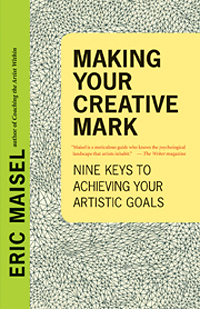 Also, the publisher is running a giveaway on their blog where people have a chance to win a creativity coaching session with Eric Maisel. Click here to sign up until May 3rd. Speaking of New World Publishing, I have to mention they are an environmentally conscious press and members of the Green Press Initiative. Making Your Creative Mark is printed in Canada on 100% post-consumer waste recycled paper. That’s another topic I’m passionate about – the environmental impact of the publishing industry – and why I’m always happy to support companies that take this road. It’s not an easy choice, but the right one. Please click here if you're interested in buying the book. It's 20% off right now. Connect with New World Library on Facebook, Twitter, and Pinterest. Connect with Eric Maisel on Facebook and on Twitter too. Have any of you felt the need for creative coaching in your careers? What do you do when you hit a creative wall? Share some thoughts with us in the comments. 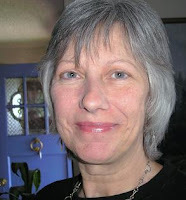 Dani Greer is founding member of this blog. She looks forward to new writing and editing projects, dreams of planting gardens, and always always can be found knitting yet another pair of socks. Visit her at News From Nowhere, Facebook, and Twitter. Sounds like an excellent motivational tool to add to any writer or artist's toolkit. I find that artistic endeavors and writing feed one another. When stuck in one arena, I switch to the other to renew my enthusiasm. Is there an Eating Key? Dani, thank you for sharing your thoughts on this. I virtually deserted my art career in favor of writing and following the dream of the great American novel. Now, I'm disillusioned with writing and feel a very strong pull back to art. You always make me think. Very interesting thoughts on the Monsanto situation. I understand how you are torn. That the produce we have now is nothing like it used to be should be a concern to everyone. Monti, we're on the same page I guess. I feel a strong pull back to my visual art. What holds me back is I haven't finished the writing and gotten past publication of a few titles - you're way ahead of me there! Thank you for the book recommendation, Dani. Nice post Dani! I struggle with the creative side. It is there and pulling me in all different directions and lately it seems nothing gets accomplished. Now I must force myself to get some writing done. Sounds like a "must-have" for the writer's bookshelves! You people and your Eating Keys! Hahaha. Should I mention that Dr. Maisel has already written about addictions in several books? Very interesting post, and the comments have been insightful as well. I have another good friend who is a visual artist primarily, but has also written some outstanding short pieces that absolutely blow me away. I have encouraged her to pursue writing professionally and her response to me has always been that her writing is what helps her become a better artist. Interesting response. I've thought a lot about this connection between creative endeavors lately and wonder if we, like Mary said, use one to strengthen the other. I love to dabble a bit with painting, and I do a lot of acting, but I would never try to pursue a career in either, even though some folks have said I could. Even though we may have many talents, maybe we are really only supposed to follow one professionally. I don't really think we're "supposed" to follow just one professionally, Maryann. I do think it's hard to focus and do justice to more than one at a time. I can't switch between painting and writing very easily - at least not to work on serious pieces - but I usually have some creative outlet unrelated to my serious work. It might be a craft like knitting, but it's some sort of counterpoint to the main focus. I'd go with the chocolate key. Seriously, I enjoy writing and never worry too much about the expected stumbling blocks. I found that when I ran out of room for needlepoint, writing filled that creativity slot in my life, and so far, I've been lucky that I haven't lost the passion. Dani I love the connection between self-censorship and loss of passion. Perhaps this is why truly great artists have so often lived lonely lives on the brink of insanity. Really something to think about: Can you speak your truth? Can you hold your ground when someone speaks against it? And are you willing to orchestrate your characters to explore all sides of an issue so the reader can decide for herself? One more of the many reasons why writing provocative fiction is not for the faint of heart!